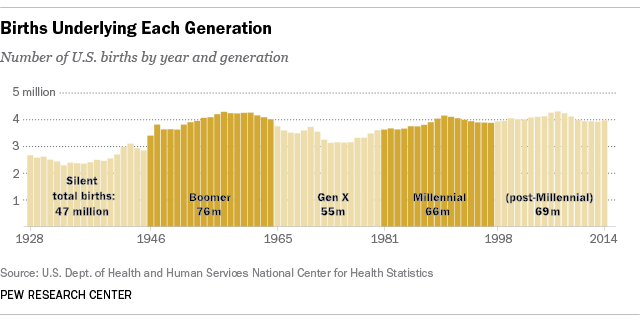 According to population estimates recently released by the U. S. Census Bureau, as of April 2016, Millennials have now surpassed Baby Boomers as the largest living generation. Baby Boomers have always had an outsized presence compared with other generations, peaking at 78.8 million in 1999. The Millennial generation continues to grow as young immigrants expand its ranks. Boomers – whose generation was defined by the boom in U.S. births following World War II – are older and their numbers are declining as the number of deaths among them exceeds the number of older immigrants arriving in the country. So it should come as no surprise that both Baby Boomers and Millennials lead the way in real estate transactions. While most Baby Boomers are looking to downsize, many Millennials are moving out of rentals and buying their first homes. Collectively, these two generations of buyers typically seek homes under 2500 SF and at a price less than $300k, while Generation X’ers – a smaller generation of buyers – are purchasing homes with more SF and at higher price points. Many Gen X’ers, who are reaching income peaks and have growing families, are buying bigger homes; but there are significantly less of these high-dollar buyers than the mass of buyers who make up the other two generations. Builders are also keenly aware of the buyer pool as many new construction developments focus on price points under $300k and maintain homes with smaller square footage. Likewise with re-sales, many moderately sized homes listed at conservative prices are going to highest and best bid situations, due to the large quantity of buyers and low inventory of available homes. With the new construction boom on the horizon, we encourage owners to take advantage of this strong market of buyers eagerly seeking to downsize or become first time homeowners.